For those of you who saw my last post (and those who didn’t), I made chicken saltimbocca and chose to serve it with this orzo dish. The two went very well together. We all know orzo dishes (picnics, pitch-ins, 4th of July, etc. 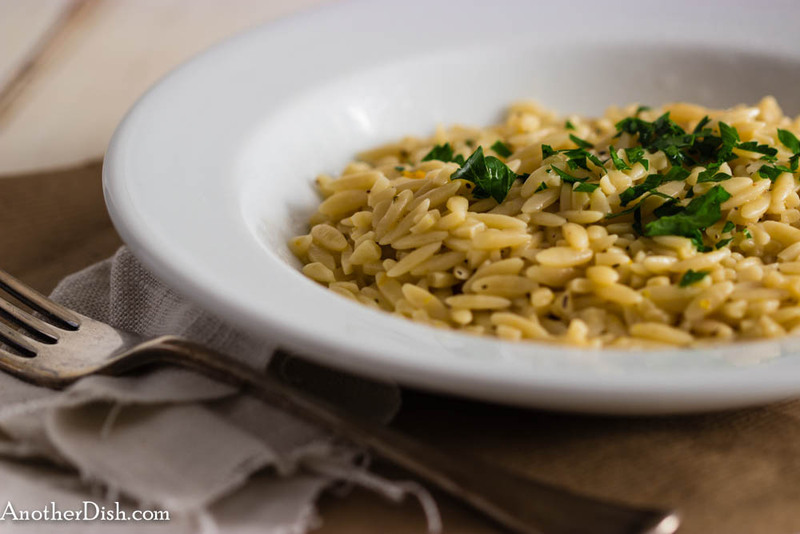 ), but this version has a very sophisticated, wonderful and savory flavor — the orange and thyme are very mild, but give this dish it’s uniqueness among orzo dishes. 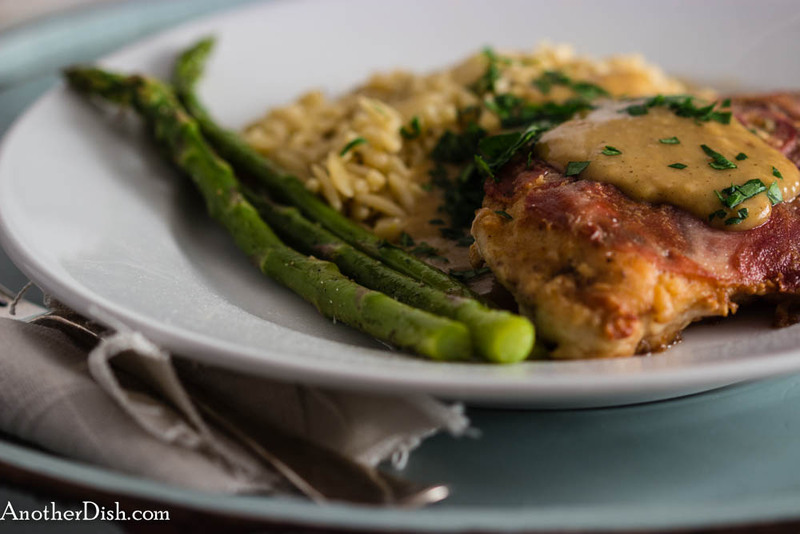 Delicious, I hope you’ll try this simple, elegant dish tonight! Bring a large pot of salted water to a boil. Add orzo and (pre)cook for six minutes. Drain and rinse with cold water to stop the cooking process. Add drained orzo to a large sauce pan, and add stock, orange zest and thyme. Bring back to a boil, then reduce heat to medium heat. Cook, stirring constantly for 5 minutes. Remove from heat. Stir in cheese, salt and pepper until well-incorporated. Plate and garnish with parsley. Serve immediately. This entry was posted in Pastas and Grains and tagged Cooking, Food, Food Photography, Foodie, Italian Food, Recipes on February 29, 2016 by AnotherDish. This dish is popular in northern Italy and Switzerland, but there are several variations around the Mediterranean. “Saltimbocca” means “jumps in your mouth,” and for very good reason — this dish is so simple and delicious, once you try it, you’ll understand why! In general, saltimbocca is a meat, such as veal or chicken, wrapped with sage leaves and prosciutto. It’s typically served with simple sauce, cooked in the same skillet as you cook the meat (hardly ever can go wrong with that). Very good — hope you’ll try it tonight! Sprinkle each breast with plenty of salt and pepper on both sides. Place 3 sage leaves on top of each breast, then place prosciutto on top (enough to cover the top of each breast in a single layer), pressing to adhere — if it’s thin enough, it will stick should stick like plastic wrap. Place 1/2 cup of the flour in a shallow dish. Gently dredge each breast, shaking off excess flour. Melt butter and oil in a large skillet over medium-high heat. Once foam subsides, place each breast, prosciutto-side down, into skillet. Cook 4 minutes, then gently turn over and cook an additional 3 minutes. Remove from heat and set aside. Whisk wine and last 2 tsp flour in a small bowl. Add broth, lemon juice and wine mixture to the same skillet. Whisk until sauce thickens a bit. Remove from heat. Season with salt and pepper. Place chicken breasts on individual plates. Top each with a bit of the lemon-wine sauce and garnish with chopped parsley. Here I served the chicken with steamed asparagus and orange and thyme-scented orzo (the recipe for which, I’ll blog about soon because it’s so delicious!). This entry was posted in Chicken, Italian, Main Dishes and tagged Cooking, Food, Food Photography, Foodie, Italian Food on February 22, 2016 by AnotherDish. Yesterday, I decided to make home-made gnocchi (a pain in the @$$, but well worth it on a Sunday afternoon). This recipe is pretty common, but I added some lemon zest and sherry, and some additional nutmeg. With the browned sage butter and Parmesan cheese…mmm, fantastic! I hope you’ll try this some weekend when you have some “me” time! Place squash half (cut side down) on a baking sheet. Brush each with olive oil. Place in oven and roast 1 1/2 hours. Remove and let cool for a few minutes. Scoop out flesh and place in a food processor. Process until smooth. Place in a large bowl and set aside. Boil potato in salted water for 20 minutes. Drain. Rice potatoes into a bowl. Measure out 2, loosely packet cups and add to squash. To the squash mixture, add 1/2 cup Parmesan, egg, nutmeg, salt, lemon zest and sherry. Gradually add the flour, kneading gently. Turn dough out onto a floured surface. Gently knead a bit further (but don’t overdo it!). Divide into 8 equal pieces. Roll each piece into a 1/2-inch rope. Cut each rope into 3/4-inch pieces. Using your hands (and additional flour, if necessary) roll each piece into the shape of a mini football. Place on baking sheets that have been lined with parchment paper. Cover each sheet with plastic wrap. Refrigerate for 1 hour. Bring a large pot of salted water to a boil. Add gnocchi and cook for 17 minutes. Drain and set aside. In a small sauce pan, melt butter over medium heat. Add sage and cook until butter is light-brown in color, about 4 minutes. Place gnocchi and butter mixture in a large bowl. Season with salt and pepper. Toss and place on serving plates. Garnish with the remaining Parmesan. Serve with a simple lemon-vinaigrette salad. This entry was posted in Italian, Main Dishes and tagged Food, Food Photography, Foodie, Italian Food, Recipes on February 8, 2016 by AnotherDish. I’m not a big dessert cook, but now and again I’ll make something that I really like. This recipe for flan is one of my favorites — it’s unique, simple and heavenly. This recipe was given to me by acclaimed dessert and salad chef, Rachel Bowen — I’m only hoping the way I make it is at least half as good as hers! 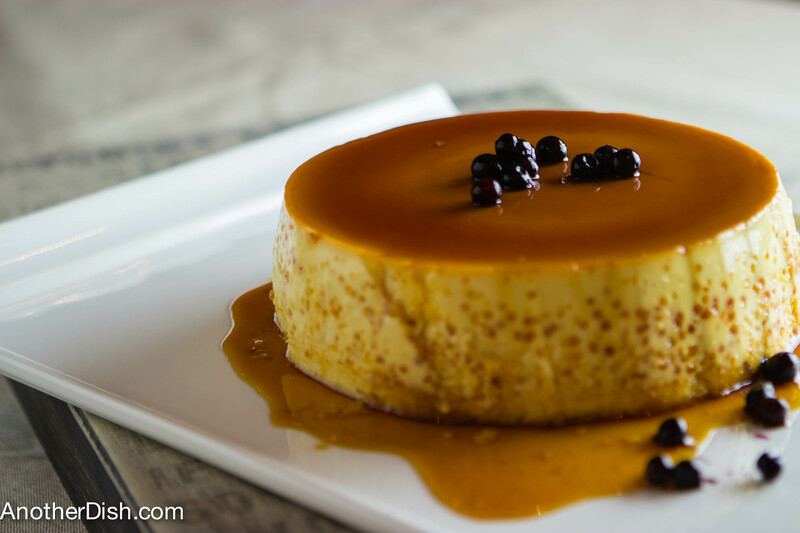 This flan is decadent and delicious — I hope you’ll try it soon! Caramelize sugar by placing it in a heavy skillet over high heat. Stir constantly until dissolved and chestnut-brown. Be very careful not to burn — if burnt, start over again! Pour immediately into a 7 inch diameter by 3 inch high ceramic dish. Set aside to cool. Meanwhile, prepare custard mixture by first beating eggs lightly in a mixer for about 1 minute. Add condensed milk and blend for another minute. Add cream cheese and beat until well-incorporated. Add milk and vanilla and blend for another minute. Pour custard mixture over caramelized sugar. Place dish in a pan — add water to pan so that the dish is submerged 1 inch. Place in oven and bake for 1 1/2 hours. Remove from oven and let cool completely to room temperature. Run a very sharp knife around dish to loosen flan. Invert onto a serving platter and garnish with blueberries. Serve and enjoy! This entry was posted in Beef, Italian, Main Dishes and tagged Cooking, Food, Food Photography, Foodie, Italian Food, Recipes on January 11, 2016 by AnotherDish. Hi everyone, and happy fall (or spring in the Southern hemisphere)! The herbs in the garden are about to become history when the first frost hits (any time now), so I wanted to make the most of them. Also, I wanted to take advantage of the few farm stands that still have fresh, tasty heirloom tomatoes, so I decided to make this dish — fantastic! 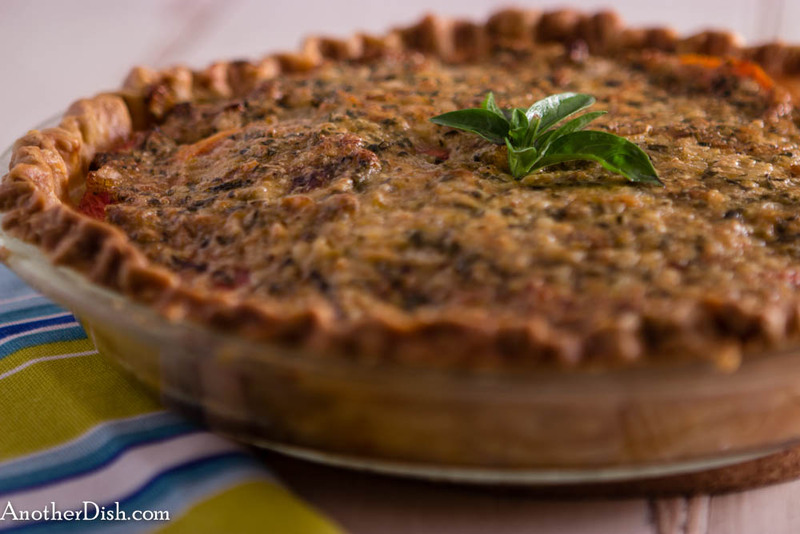 The simple, fresh ingredients all come together in this European-style, savory pie. I served it with a simple green salad, and it was a perfect, light meal. I hope you’ll try this before the fresh tomatoes and herbs are done for the season! 1/4 cup chopped fresh herbs, such as basil, thyme, oregano, parsley, etc. Place tomato slices on paper towels, sprinkle with 1/4 tsp salt, cover with more paper towels and let stand for 30 minutes (you want them to be pretty dry). Place dough into a 9-inch, glass pie pan. Crimp edges. Line with parchment paper and fill with pie weights. Bake crust 20 minutes, rotating 180 degrees after 10 minutes. Remove pie weights and parchment paper, and set aside. Meanwhile, heat butter in a skillet over medium heat. once foam has subsided, add onion and 1/4 tsp salt. Cook until carmalized, about 10 minutes. Remove from heat and let stand. In a medium bowl, combine cheese, mayo, chopped herbs, hot sauce, ground black pepper and onion mixture. 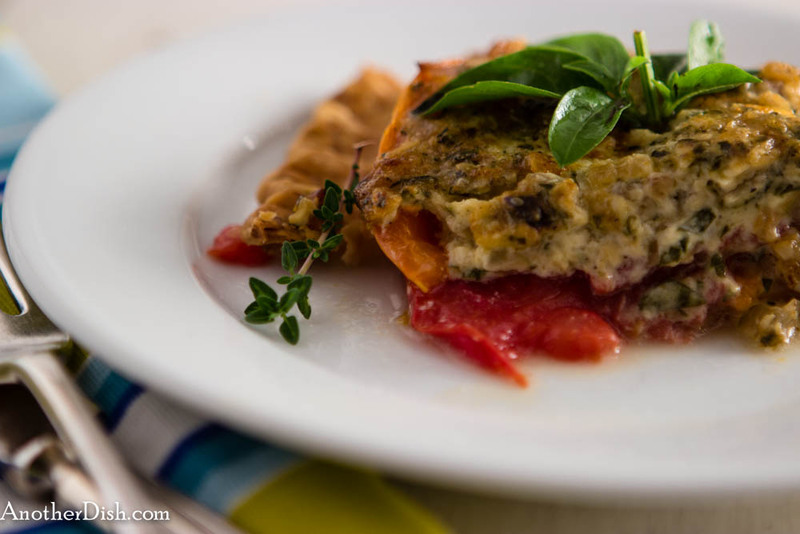 Assemble tarte by lining bottom of pie shell with tomato slices and top with the cheese mixture. Place in oven and bake for 40 – 45 minutes, until golden brown (rotating 180 degrees halfway into baking). Remove and let cool to room temperature before serving. This entry was posted in French, Italian, Main Dishes, Vegetarian and tagged Comfort Food, Cooking, Food, Food Photography, Foodie, French Food, Italian Food, Recipes on October 11, 2015 by AnotherDish. 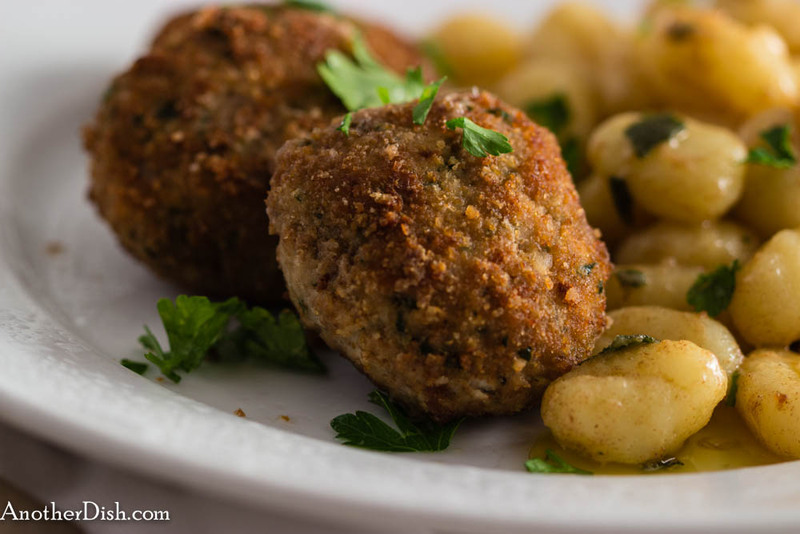 Last night I was in the mood for a good croquette dish, so I made this Italian version — so simple and delicious. The capers add a great touch! Wasn’t sure what to serve them with, but I ended up going with gnocchi in browned butter, flavored with sage leaves — the perfect complement! I hope you’ll try this wonderful combo tonight (or tomorrow night)! In a large bowl, combine the first 7 ingredients (capers through black pepper) — do this with your hand to ensure ingredients are well-incorporated. Shape mixture into 1 by 3-inch patties. Heat oil over high heat in a 12-inch skillet. Once oil is good and hot, dredge each patty in the bread crumbs, and gently slip into the oil. Cook patties until golden brown, about 3 minutes per side. Remove patties from pan with a slotted spoon to paper towels and let drain. Meanwhile, cook the gnocchi according to package instructions. Drain and set aside. Heat butter in a large skillet over medium-low heat. Add sage leaves and cook until butter begins to brown to a nice amber color (but don’t burn), about 4 minutes. Remove sage leaves to a paper towel. To the browned butter, and the gnocchi, chicken stock, pinch of salt, Parmesan cheese and cooked sage leaves. Gently toss to coat. Serve with the croquettes. This entry was posted in Italian, Main Dishes, Pastas and Grains and tagged Capers, Cooking, Food, Food Photography, Foodie, Italian Food, Recipes on May 11, 2015 by AnotherDish. It’s been a while since I made a meatloaf (long overdue in my book). I ended up making a variation that I call “meat rolls,” which are smaller, breaded and braised on top of the stove. The amount of mushrooms the recipe calls for may seem huge, but necessary. Don’t worry, they cook down, and the resulting sauce is fantastic!. Another thing, the nutmeg in the meat mixture adds a ton of “depth of flavor” in European meat dishes, so I’m always trying to figure out how to incorporate into mine. 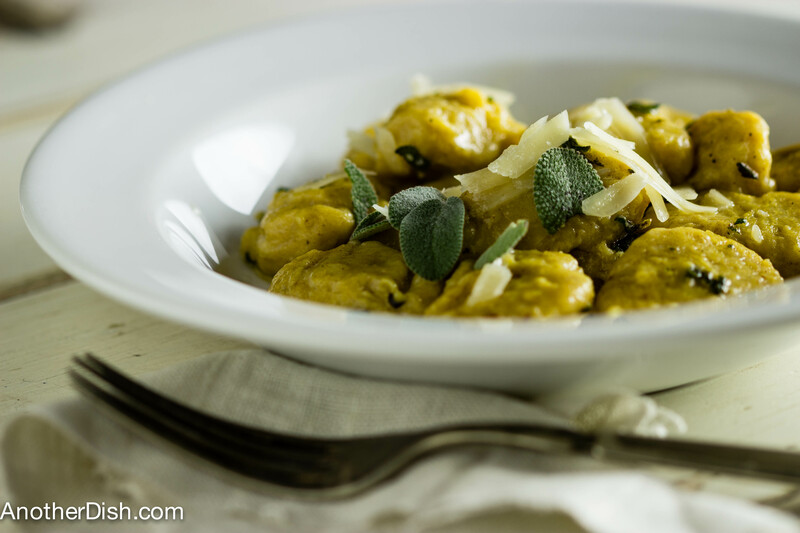 This is a great Sunday afternoon or evening dish — hope you’ll try it! Soak bread in milk in a small bowl, then squeeze out all of the milk. Set aside. Heat 3 Tbsp of the olive oil in a large skillet over medium-high heat. Stir in the onion and cook 5 minutes, or until light brown. Add the mushrooms, 2 tsp of the salt, 1/2 tsp of the black pepper. Cook 20 minutes, turning and stirring the mushrooms until they are soft and have released their water. Remove from heat, cover and set aside. In a large bowl, combine the soaked bread, meat, parsley, eggs, cheese, nutmeg, 1 1/2 tsp salt and 1/2 tsp black pepper. Use your hands to ensure that the ingredients are mixed well. Add some bread crumbs if mixture seems too loose. Divide meat mixture in half. Roll each half into a cylinder that is about 4 inches in diameter. Place bread crumbs in a shallow pan. Gently coat each meat roll (abundantly) in bread crumbs. Heat 2 Tbsp olive oil and the 3 Tbsp butter in a large pan over medium-high heat. Once the foam from the butter has subsided, gently add the breaded meat rolls. Brown on all sides, about 4 minutes. Add wine to the pan and cook about 2 minutes, until the wine is reduced considerably. Cover pan, reduce heat to low and simmer gently for 1 1/2 hours, turning the rolls from time to time. Add mushroom mixture and cook, covered, another 15 minutes. Uncover, stir in the cream and cook an additional 12 minutes. Remove meat rolls and slice into 1-inch pieces. 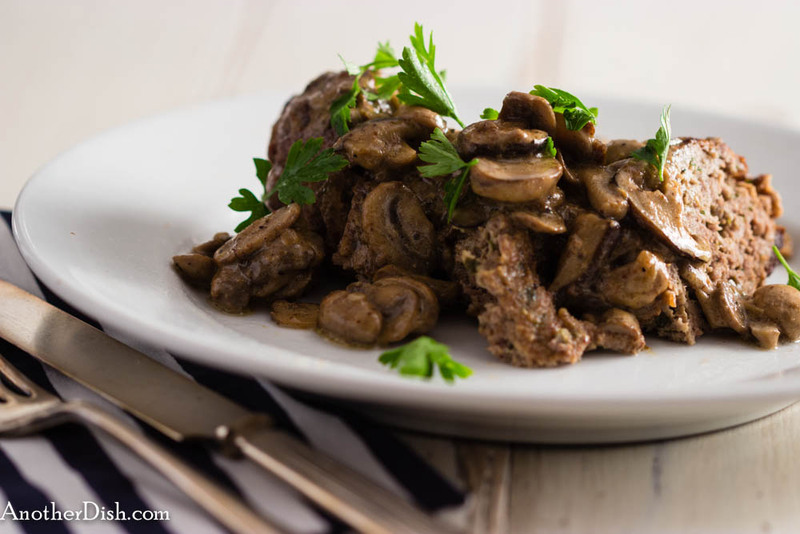 To serve, place a few slices of meat on each plate, spoon the mushroom sauce over each serving and garnish with parsley. Service with a starch and green vegetable. This entry was posted in Beef, Comfort Food, Italian, Main Dishes and tagged Comfort Food, Cooking, Food, Food Photography, Foodie, Italian Food, Recipes on April 27, 2015 by AnotherDish.